To kick off this brand new trading week, we are interested in tracking a range of calls in the BABA chain, after shares dipped on the news that co-Founder Jack Ma will be stepping down and handing full control over to the CEO effect next year. The reactionary selloff may provide us with some solid options trading chances, so we are going to keep an eye on the BABA 10/12 $165 & 167.50 Calls in the days and weeks ahead. 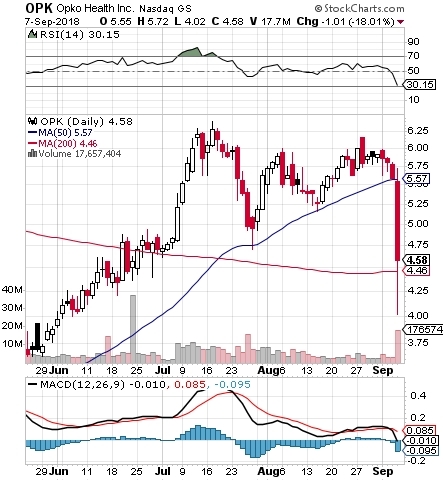 Shares of OPK took a bath on Friday, briefly falling below the stock’s 200DMA, and closing well in the red on the day. We’re going to signal our interest in tracking OPK as a bottom-watch play. The stock is approaching extremely oversold territory, and in the midst of its downturn we observed some Form-4 submissions, with insiders buying up shares on Friday as the bottom fell out. That suggests a confidence that it may not have much further to fall, so we will want to hang around as OPK searches for a bottom and solid rebound point. Among our fresh ideas for yesterday’s premarket report was GIII, in whose options chain we signaled a pair of contracts for observation shortly after the company’s quarterly report was issued. Those were the GIII 09/21 $45 & 50 Calls, and despite a very up-and-down session for the stock itself, opportunities for intraday profits were on the table early on in the session. The $45 Calls traded up from a low of 2.67, to as much as 6.00, representing an upswing of 125%, while the $50 Calls ran from 1.03-2.49 for a 142% pop. These could still see further action down the line. still being two full weeks from expiration, with the current bearish attitude of the market being only a temporary hurdle. **Please do not trade weekly options on a Friday unless you are an advanced level trader with disposable funds!